In general, the church in America today is in great need of renewal. There is plenty to lament, and there is much work or reformation to be done. However, one major hindrance to such renewal work is well-meaning but hot-headed laborers who too easily think that offending church members is the primary mark of faithfulness. Of course, we must fear God and not man. Of course, truth will sometimes offend. But, as shepherds, we must strive, as much as is possible, to be at peace with all men. We must be patient and seek to win people to the truth, not simply rebuke and be on our way. Strikingly, Calvin once made this point to his friend and co-laborer, Guillame Farel, the man whose fiery challenge had first convinced Calvin to stay and work in Geneva. Farel was bold. 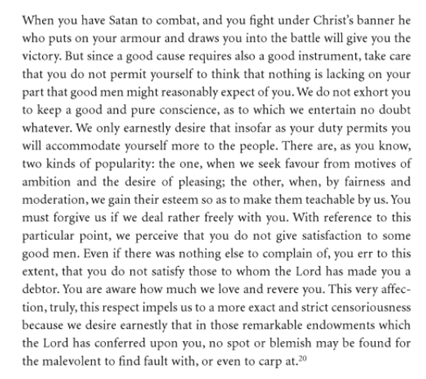 But in the letter excerpt below Calvin provides wise pastoral counsel not only for Farel but for all who labor for the good of the church today.